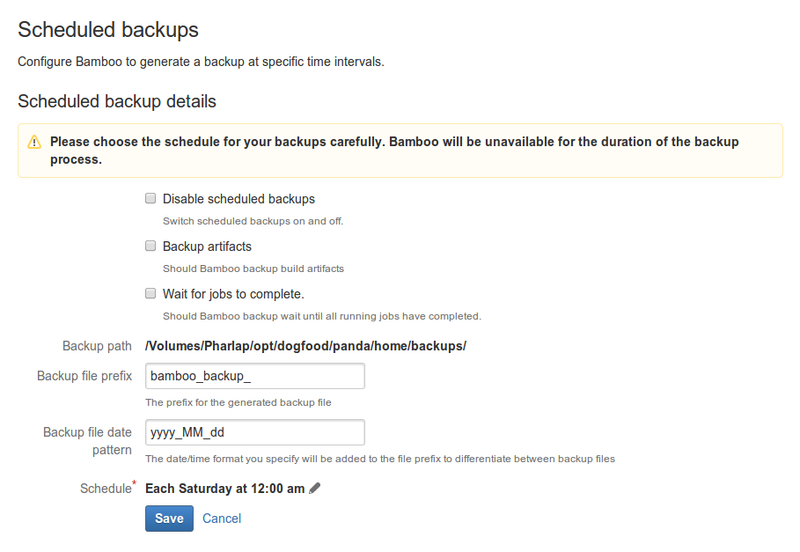 You can configure Bamboo to automatically create a backup each night, rather than doing a manual export every time. Bamboo will be unavailable while the backup process completes. The export itself may take a long time to complete, depending on the number of builds and test. We recommend running your backups at a time of day or night when usage is low. Backups may require large amounts of disk space, depending on the number of builds and tests. Please make sure you have enough disk space in your desired backup location before proceeding. Bamboo will not export if plans are currently being built (see Using the Bamboo dashboard). For large instances we recommend using native database and filesystem backup tools instead of the built in backup/export functionality. For more details, see Automating Bamboo backup operations. Reserve the use of the built-in tools for database type migrations only (e.g. MySQL to Postgre). Click Scheduled Backups in the left navigation column (under 'System'). This check box must be cleared for automatic backups to be performed. Select if you want to include build artifacts in your scheduled backups. Specify the directory where you want to store your backups. Each backup will be stored as a single file. It may be necessary to modify the Bamboo bamboo.paths.set.allowed system property to do this. Bamboo restricts the editing of certain file path settings for security reasons (see Bamboo Security Advisory 2010-05-04). If you must configure Bamboo to permit modification to its file path settings, start Bamboo with the system property bamboo.paths.set.allowed=true. The procedure for configuring a Bamboo system property is described on Starting Bamboo. Specify the first part of the filename for all your backup files. Specify the date/time format for identifying your individual backup files. This will be appended to Backup file prefix to form the complete filename for your backup files. Use the Schedule Editor to choose the frequency with which backups will be performed. See Cron-based scheduling for more information about the Schedule Editor. Click Save. Your first backup will run when your server's clock matches the specified time. If you disable schedule backups, your schedule details will be retained but no automatic backups will be performed. Click Scheduled Backups in the left navigation column. The 'Scheduled Backup Details' page will be displayed, showing details about the status of scheduled backups or any currently configured backup. Click Edit to edit the current 'Scheduled Backup Details'. Select the Disable scheduled backups check box.